A big Hi to all my friends and co bloggers out there…..More than two years, I have abstained from blogging. My new job, hectic works, distant travelling and very few hours of rest….. Was running around to get things done. When I look back, I just wonder that I could not even open my blog or facebook page for the past 2 years…….What a pity…..I wish I can be back to blogging just as before and this is a start up for it.Wish me luck pls…. Today I am going to introduce something which all of you would be interested in. 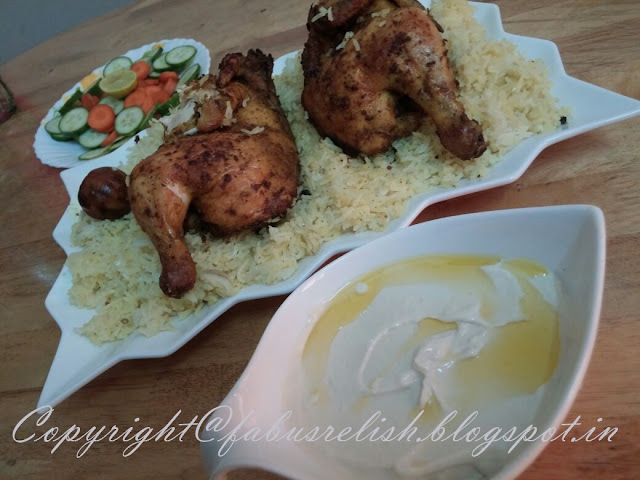 Though I was brought up in the middle east, I was never a fan of grilled chicken until I had a grilled chicken from Farooj Express of Ajman.It comes as a combi of either chicken and rice or chicken and khubz with Hummus. If buying from Farooj Express,I prefer Khubz along with it and if preparing at home,I prefer rice cooked in my style. I am not sure if the brand is available all over middle east or even UAE. But I give you the word that it is one of the must eat grilled chicken if you are a fan of them. 1. Take the whole chicken and clean its outer skin and the inner area by putting your hands inside and removing the materials inside and rubbing with a little lemon juice or salt.Wash the chicken many times so that there is no waste materials in the chicken. Make sure the feathers are completely removed from the outer skin. 2. Do not remove the fat of the chicken as this is the main part which gives the taste to the dish. 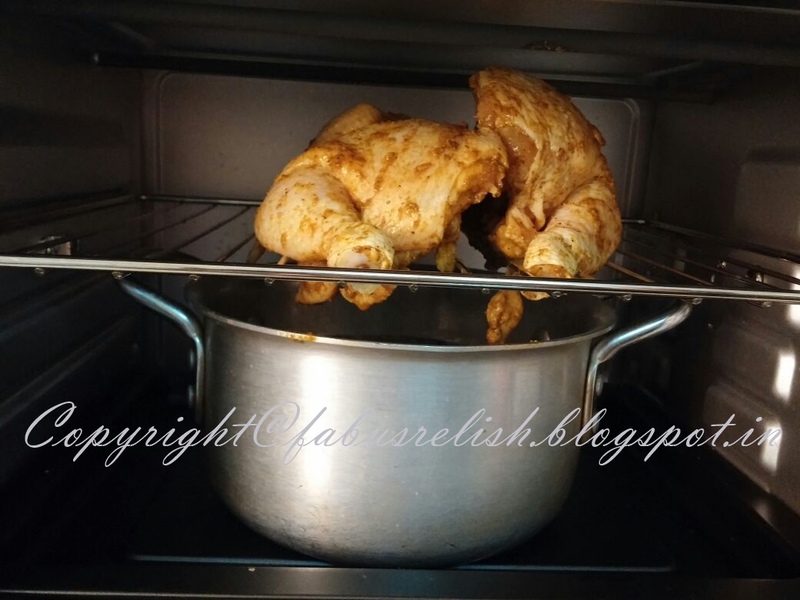 For convenience in cooking in oven, chicken can be cut into half vertically making sure that the skin does not come out. 3. Mix the Hawaij Spice mix, lemon juice, Salt and pepper in a bowl. 4. Marinate the chicken with marinade and keep it aside for half an hour. 5. Preheat the oven to 200 degrees Celsius for 10 minutes. 6. Meanwhile you can start the preparation of rice by heating a pan and adding oil to it and sauting the onions. 7. When it becomes transparent, remove it from the flame. 8. In another aluminium vessel (I used Aluminium vessel because I cook in electric oven and if it is a microwave oven, a microwave safe dish can be used), put in the soaked rice,sauted onions,hot water,salt and all other ingredients mentioned in the rice recipe.Give it a good stir and keep in the lower part of the oven. 9. Now take the iron wire rack and place the chicken on top of it. Brush the chicken with some oil. Make sure that while cooking the fat of the chicken will be collected in the rice vessel kept below. 1. Cook for half an hour at 190 to 200 degree Celsius alternatively stirring the rice once or twice. 2. After half an hour, turn over the chicken upside down and brush it with some oil so that the other part gets cooked. 3. Now cook it for another half an hour until the skin turns brown and a little fried up. To get the skin fried, you can increase the temperature to 210 degrees and cook for 5 more minutes. 4. During the whole process, make sure that the fat of the chicken gets collected in the rice. 5. Now switch off the oven and take out the rice vessel from it and check if there is still water in it. 6. If there is still water in it, place the vessel on a low flame on a gas cook top and stir until the water is absorbed by the rice completely. Do not worry that it will be over cooked because once it is removed from heat, you will notice that the tenderness disappears and it becomes rightly cooked to the correct consistency. 7. Now serve it the rice on a tray with the chicken placed on top of it. Salted vegetables and a kick of Sprite or Seven Up goes well with it. Am sure the aroma of the chicken while cooking itself would make you go mad….One best dish to try and am sure you would not miss to prepare it every weekends…..Njooyyyyy…. Note : Vegetables like carrot, beans and green peas can be added to the rice along with other ingredients if preferred. Khubz can also be served with chicken and rice with some hummus. Copyright Patent by Fabusrelish. Picture Window theme. Powered by Blogger.